Are you planning a Full Moon walk with your family this week? This month’s Full Moon is on April 4, 2015 — traditionally called the Pink Moon, is also going to include the first total lunar eclipse of 2015! A lunar eclipse occurs when the moon is in the Earth’s shadow. In some locations, the shadowing can cast a red glow on the moon, and so the moon can also be called a Blood Moon. Solar and lunar eclipses always arrive in pairs — the lunar eclipse coming 2 weeks after the solar eclipse. This and other interesting eclipse tidbits can be found at timeanddate.com — the website includes viewing information, video clips, and helpful explanations. 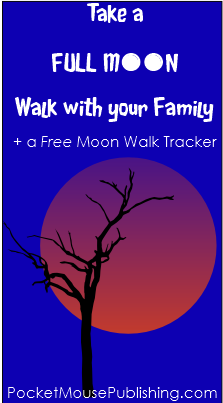 Download your free Full Moon Walk tracker and enjoy this special time outside in nature! Great idea for a nature walk! I never thought about after dark walks – love it! Thanks for coming by Tonia! The best part about a full moon walk, is if you miss one (unlike the eclipse! ), there will be another one next month! I’m hoping your website will encourage me to at least appreciate what there is to love about math!